Between singleness and marriage lies the exciting, but often heartbreaking journey of dating. Relationship expert Dr Henry Cloud and Dr John Townsend help you make this experience as smooth as possible by identifying the healthy relational boundaries that lead to rewarding dates. Rules for Romance That Can Help You Find the Love of Your LifeBetween singleness and marriage lies the journey of dating. Want to make your road as smooth as possible? Set and maintain healthy boundaries--boundaries that will help you grow in freedom, honesty, and self-control.If many of your dating experiences have been difficult, Boundaries in Dating could revolutionize the way you handle relationships. Even if you're doing well, the insights you'll gain from this much-needed book can help you fine-tune or even completely readjust important areas of your dating life. Written by the authors of the bestselling book Boundaries, Boundaries in Dating is your road map to the kind of enjoyable, rewarding dating that can take you from weekends alone to a lifetime with the soul mate you've longed for. Customer Reviews For "Boundaries in Dating"
Excellent book for those new to dating. Provides insight into making and growing healthy relationships. This practical book written by Dr Cloud and Dr Townsend gives great advice for those who are interested in the dating "game". The two use great examples, both in the form of testimonies and the bible, to explain how Christians of all ages should date. Definitely a must read for all Christians dating! 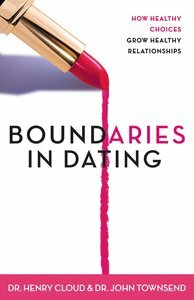 I'm really excited about this book as christian psychologists explain the why it is so important to have boundaries in dating. It helped me understanding why some of my past dating experiences have been hurtful and how I could have avoided been hurt if I had healthy boundaries. I would recommend this book to all teenagers and young people who are entering the dating scene. This book changed my perspectives and I reccomend it for anyone nearing dating age, those entering the dating scene or those in it now... Stop and read this book... Do dating right the first time!!! Be blessed! !